Meet our Reeler Of The Month, Ronalei Silmonet. 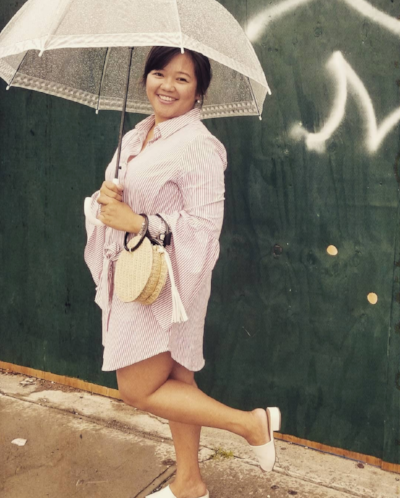 Ronalei works in real estate in New York State and has been a reeler for some time now. Last October, she saw an Instagram ad for Reel and decided to give it a try. She first saved for a little black dress and since then has reeled in 7 items (and counting)! Our ROTM is more than a personal finance connoisseur, she’s a fashionista! Her personal style can be described in one word; trendy. “I like to wear whatever is new and popular in the market,” says Ronalei. Q: What are your favorite brands? A: Jo Malone, Adidas, Lacoste, Nike, Puma and Balenciaga. Q: What completes your look? A: A spritz of Jo Malogne Perfume, a big tote bag and new Adidas sneakers. One big part of Ronalei’s life is that she enjoys working out, walking in Central Park, and exploring New York City, when she can. One common denominator here is athleisure! Being comfortable on the go is always a plus and right now it’s trendy af—especially athleisure sneakers. Ronalei has reeled in 2 Adidas sneakers and is planning on saving for the new, Selena Gomez endorsed, Puma sneaks and a pair of fashion forward Balenciaga kicks! Safe to say, she’ll be rocking the latest in fashion, while being comfy and cute. Enjoy your new shoes, Ronalei, and keep shopping smart! Follow Ronalei on Instagram here.